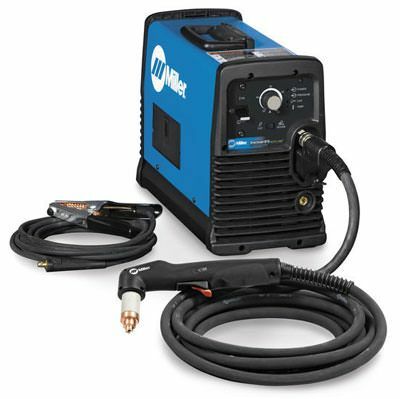 Miller Spectrum® 875 plasma cutter with Auto-Line™ and 20 foot XT60 torch has a compact size but packs 60 amps of cutting power in a plasma cutter with easy operator controls. New Auto-Line feature allows this plasma unit to automatically connect to any primary input voltage from 208 - 575 volts single- or three-phase, 50 or 60 Hz. CAN THIS MACHINE RUN USING 460V 3 PHASE ? Miller Spectrum 875 Auto-Line Plasma Cutter w/20 ft. Torch 907584 will run off of 460 - 3 phase input power. What is the SCFM rating for the air compressor needed for this machine to ensure solid performance. I know the machine says 6.75 SCFM; but what is the REAL size I need? 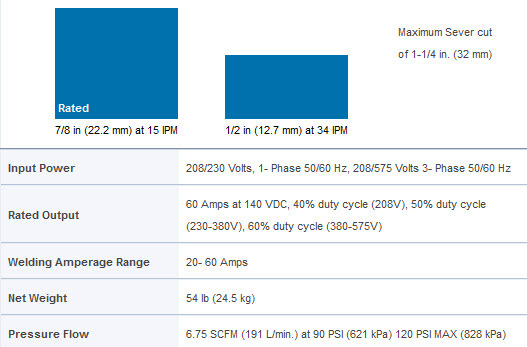 Miller indicates that the Miller Spectrum 875 Auto-Line Plasma Cutter w/20 ft. Torch 907584 requires a minimum of 6.75 SCFM in order to operate at its RATED output. Can this cut aluminum @ 1"